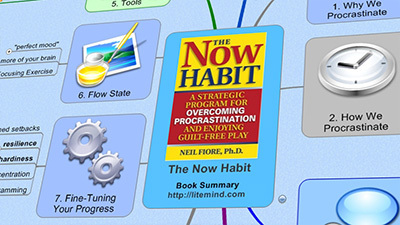 In this post, I present a mind map with the full summary of the book The Now Habit: A Strategic Program for Overcoming Procrastination and Enjoying Guilt-Free Play. Despite a cover that reminds me of the “remarkable” Windows 3.1 ‘Hot Dog Stand’ color scheme, I don’t have much to say about The Now Habit other than it’s one of the most useful books I’ve ever read. Since its publication back in 1988, it has become well-known among chronic procrastinators looking for ways to overcome this crippling condition, and for very good reasons. As the title of the book suggests, procrastination is a habit — it’s not caused by lack of organization or lack of time management skills. If you’re looking for time management tools as a way to overcome procrastination, I suspect you may be getting yourself just another set of toys to play while you procrastinate. Back in 2004, when implementing the David Allen’s Getting Things Done method, I fell exactly in that trap: tweaking my to-do lists, installing the latest software on my PDA and clearing my inboxes all worked as perfect excuses to avoid doing what I knew I was supposed to be doing instead! Don’t get me wrong: I’m a big fan of Getting Things Done and other time management methods — they really work for me today. But if you’re caught in the procrastination habit, time management alone won’t have any lasting effect on your unproductive behavior. That’s why when someone asks for my advice about implementing the Getting Things Done method, I can’t help but recommend Neil Fiore’s The Now Habit, which, at least for me, was the missing piece to make it work. I intended the mind map below to be as thorough as possible; it doesn’t replace the book, of course, but you can get a pretty good idea of its entire contents. 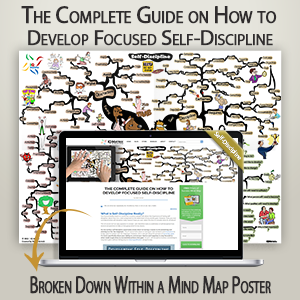 Also, if you already read the book you can use the mind map to quickly refresh it in your my mind at anytime. Viewable in your browser, requires Flash Player. If, on the other hand, you’re interested in checking a summary in a more “conventional format”, there are many great ones floating around on the Internet. To get a quick glance of the tools and methods available in the book, this article in the MineZone Wiki has a bulleted, easy to read summary. Benjamin Ellis of WOWNDADI has also done a terrific job in a chapter-by-chapter summary.